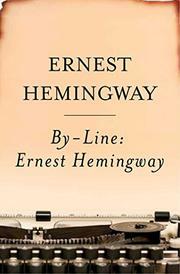 A lifetime selection of Hemingway's professional non-fiction as a reporter and columnist, this is a long-awaited book in the hardcover canon of the century's most imitated and most envied writer, and the man who built the tallest legend. His perfectionism seldom wavers in these pieces, though the later selections from Look magazine are in the garrulous Papa manner. The selections are in five categories. His four years (1920-1924) as a "Canadian" reporter for the Toronto Star find his famous tight style taking shape through Paris and the capitals. (For this period, Hemingway's work is better represented in Dell paperback-- Hemingway: The Wild Years--which has forty-eight stories in addition to the twenty-five in By Line However, By-Line contains "Christmas on the Roof of the World" which the Dell book does not and which is the most moving, exciting story in either book.) The second period (1933-1939) contains his columns on fishing, bulls and the Spanish Civil War. While the style is still great, the Papa figure intrudes, not unpleasantly, and the stories are less tensely organized. The third period is high-powered reportage on the Civil War for North American News Alliance, and the fourth section finds "Ernie Hemorrhold, the poor man's Pyle" going into the Normandy beachhead on D-Day for Collier's. The last section is potpourri from the big slicks. By-Line contains dozens of incidents later novelized or used in short stories. Perhaps the century's greatest travel writer, his European catalogue of winds, breezes, trees, funiculars, rivers, lakes, wines and fiestas are nonpareil. As Lillian Ross might have put it, Hem feller have heap big magic.